Well folks, it’s flu season and it seems like there’s no escaping it. Hospitals all over the country are having to send flu sufferers away because their ERs are full, coughing is the normal ambience, and hand sanitizer is the new perfume. I myself have just recently turned the corner and started to feel better after coming down with the flu. I’ve never felt so sick in my life. There was one point when any where I touched my body it hurt and I my abs began to get sore from coughing. Luckily there are some pretty simple ways to ease yourself through the flu and reach the light at the end of the tunnel. If you’ve been a regular reader on our site you may start to think our answer to everything is, “stay hydrated!” And to be honest, it usually is. Hydration is key when you’re sick and your body is working hard to get rid of your illness. Staying hydrated helps regulate fever and replenish the water levels in your body after fevers recede. Staying hydrated, especially with the flu, also helps keep the mucus in your sinuses and chest thin, allowing you to clear your airways more easily. Hot tea and water with lemon are great choices, I especially enjoyed drinking Traditional Medicinals’ Throat Coat tea. It really helped reduce my sore and itchy throat coughing and it tastes great. But be sure to stay away from coffee and caffeine as well as sugary sports drinks such as Gatorade. With how busy our lives are with our daily commitments to work and family it’s hard to stay home and rest but do it! It’s so important to give your body the time it needs to recoup without straining yourself. 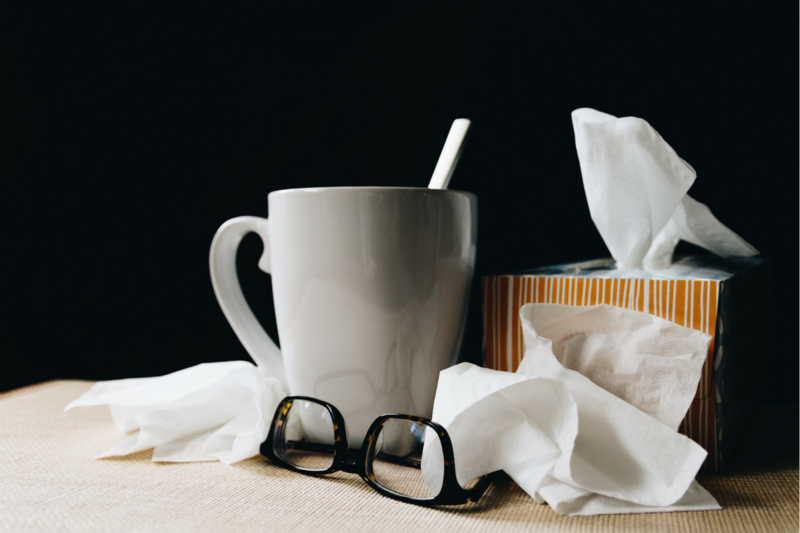 With the flu, fatigue is a major symptom that can completely knock you out. So, stay home – you’ll want to, your co-workers will want you to, and every other person you may come in contact with will want you to. I can honestly say that these medicines probably kept me out of the danger zone with my case of flu. The NyQuil especially helped me because my fever and body aches seemed to be the worst while I was trying to sleep through the night. These medications offered the pain relief, fever control, and helped clear out both my chest and sinus congestion in a way that allowed me to comfortably rest. I would have been completely miserable without them. I love Epsom salt baths on a regular basis, but they do have great therapeutic effects while your sick. Although I will suggest only bathing when you’re not running a high fever as that can be even more uncomfortable. Once I was passed fever stage, I took a couple baths and added some essential oils like peppermint to help with my congestion which seemed to not only add to the spa effect but really open up my airways. Plus, the hot water really helped ease my sore muscles and let me rest even more comfortably after I got out. Speaking of essential oils, using a diffuser is a great way to get a better night sleep, less congestion, and a sense of ease when trying to rest. I used a Now Essential Oils blend called Mental Focus. I usually use this blend when I want to feel awake and alert but while in the bath and while resting this blend of lemon, peppermint, wintergreen, basil, rosemary, and grapefruit really helped open my sinuses. I also liked using Juniper Berry to help with my congestion as well. For relaxation and a good night’s sleep I always find that straight Lavender is the best bet. It is so easy to relapse with such a strong illness like the flu. Take it easy as you start to feel better, don’t jump right back into your normal routine. Of course once you are past the contagious stage you’ll need to head back to work, but keep it as non-strenuous as possible. Your body will thank you. Stay healthy, stay happy, and take care of yourself.